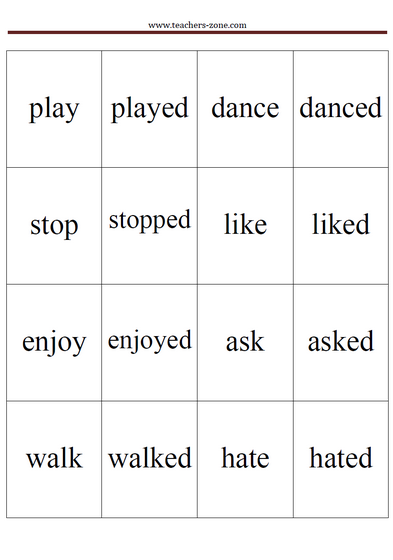 Encourage your students to play memory game to remember past forms of verbs. Print these cards, cut them out and play the game. Download free mamory cards for irregular past forms. Download free memory cards for regular verbs. 1. Download memory cards for irregular verbs or regular verbs and cut them out. 2. Put the cards facedown. 3. Randomly flip two of them and say the words aloud. 4. If the uncovered cards match, remove and keep the pair of cards. Then get another turn as a reward. 5. If the uncovered cards do not match, the two visible cards are flipped to be facedown. 6. The winner is the player with the most pairs of cards. 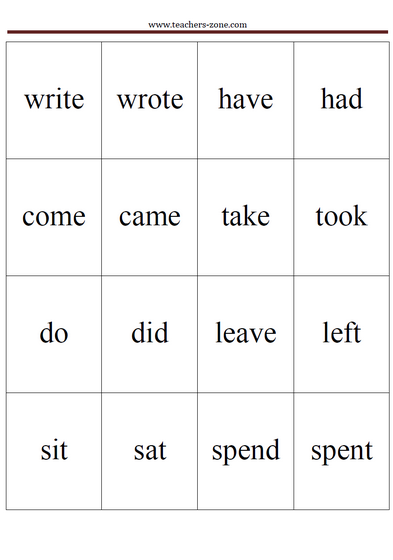 Download free domino sets for irregular verbs. Download free domino sets for regular verbs.